If you like my giant breakfast cookies you’ll love these chewy brownies. 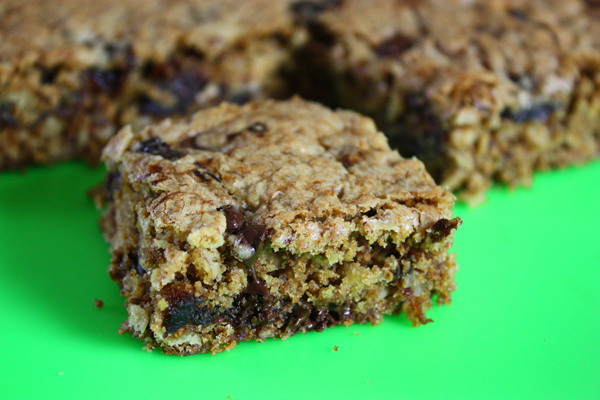 Moist prunes are key to keeping these bars moist. If you can't find Sunsweet in a can you can pour boiling water over dried prunes in a bowl, cover and let stand for 15 minutes. Drain and chop. And if you can’t find All Bran use another high fiber cereal. Grease a 9 x 9 square baking pan or line with foil. With an electric mixer on high, beat oil, sugars, eggs & vanilla about 2 minutes until thick. On low speed, fold in dry ingredients, prunes & chocolate chips. Mixture will be very thick. With wet hands, press evenly into pan. 10 Comments on "Breakfast Brownies"
OK its me again. Finally made these using 1/2 cup of wheat bran instead of all bran cereal and all white sugar because I had run out of brown. I also added more choc chips. Turned out well! My 3 yr old son and 11 mth daughter loved it too! Thanks again jenny! You are amazing!! Would I be able to sub wheat bran or five grain granola for all bran cereal and also would I be able to use only white sugar or would that alter the texture too much? I have made these twice. I did make some changes. I used Stevia instead of white sugar and I replaced the oil with peanut butter and added in 1/4 cup Greek yogurt. I also used quick oats instead of rolled. can I increase the quantity of oats to 1 1/2 cups and omit the all bran cereal? Hi Jenny, I’m using dried prunes, so I hope this isn’t a stupid question, but once the water is boiling and the prunes are being soaked in them, do I leave the water boiling for the entire 15 minute period? No, you put the prunes in a bowl and pour the boiling water on them and just let them stand in the bowl, covered, so they soak up the hot water. After 15 minutes, drain them and chop. Jenny, I remember when u had a t.v. show and u said that u speak Hebrew because u lived in Israel. Do u have any recipe that u can recommend? You may have me confused with someone else. I do not speak Hebrew and never lived in Israel. I grew up in Canada and spoke Polish. Jenny I am so glad I found you,I was wondering if you could help me lose weight.I love the way you cook and bake Thank you for sharing all of your recipes.